Posted on November 3, 2015 at 10:05 pm. 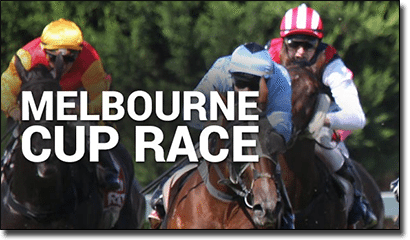 Deemed ‘the race that stops a nation’ the Melbourne Cup is the biggest horse race in the Southern Hemisphere, an event that’s deeply seeded in Australian culture. Never one to miss the chance to join in on a good old fashioned Aussie celebration, Emu Casino is getting into the spirit of the Melbourne Cup by offering pokies players a prize pool share of $3,000 on top of standard slot wins. No need to throw on a fascinator, your suavest suit or a fancy spring frock here; you can be part of this Melbourne Cup prize pool from the comfort of your home wearing your daggiest trackies. The Melbourne Cup pokies race is happening at EmuCasino.com from November 2nd to November 8th. Opting-in to this promotion is automatic, so once you’ve signed in you’ll automatically join your place in the race. If you don’t have an account at Emu Casino, click our links to register and you’ll also receive a triple welcome bonus up to $300. Once you’re signed in, all you need to do is start playing any of the pokies available at Emu Casino for real money wagers, placing a minimum bet of at least .30 per spin. All pokies are eligible excluding progressive jackpot pokies and it only takes one spin to qualify for a place in the race. The more spins you place the higher you climb up the leaderboard, making your way closer to the front as you play. You can check your place in the leaderboard at any time by clicking on the ‘Casino Races’ tab from the Emu Casino homepage. EmuCasino.com has over 360 online pokies to choose from including popular titles like Immortal Romance, Hot as Hades, Avalon 2, Forsaken Kingdom, Thunderstruck II, Legend of Olympus, Dragon’s Myth, Ariana, Rugby Star, Treasure Island and Goldilocks so you’ll have no problem racking up those spins to claim your place on the leaderboard. There are also plenty of secure deposit options for Aussie players, with instant payments accepted from Visa, MasterCard, Skrill, Neteller, POLi and Paysafecard. Head to Emu Casino before the 8th of November and play real money pokies to spin your way to win the Melbourne Cup prize pool.